It will come as no surprise to you all that we’ve been experiencing some unfavourable weather recently. Not only are we almost in December, where freezing temperatures and downpours are expected, but we’ve also been subjected to storm Barney’s ire too. Gale force winds, harsh hailstones and torrential rain have battered us here in the UK and whilst it’s not pleasant for the majority of us, our gardens have been taking the full brunt of Barney. Nobody likes to see their garden getting a hammering but if you’re a dog owner the consequences can be even worse. It’s fine for us to hide away indoors without venturing outside but for dogs, they have no choice. The scene isn’t a pretty one. The rain is hammering down, making your grass soaking wet. Your dog goes out into the garden, which by now has turned into a murky, muddy swamp. Upon returning, muddy paw prints are trailed through your home and your garden is a left in a complete mess whilst you scrub at your carpets; trying to remove the dirt. However, there is a solution. Here at Great Grass, we have artificial grass for dogs that can transform your back garden. With our artificial grass for dogs it doesn’t matter what kind of storm occurs, how much rain pours from the skies or how much your dog frequents the garden, you won’t have a muddy, messy garden on your hands. We’re the number one supplier of artificial grass for dogs here in the UK and dog owners love the transformation artificial grass has on their gardens. Because there is no mud, no maintenance to do and no muddy paw prints – artificial grass for dogs is a hassle-free alternative to having a natural lawn. Plus, it looks good all year round, whatever the weather. 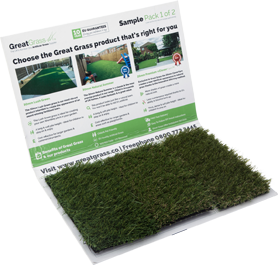 To find out more information about our artificial grass for dogs, then contact us today and order your free sample!